Just as surfaces and devices, metal parts and engines also require regular cleaning. In this specific case, it is recommended to use a cleaner that is intensive and highly effective and that can still be applied at room temperature. That is why Caramba developed the intensive cold cleaner for domestic use. Using this product will enable you to obtain the best cleaning effect on your vehicle or other metal objects based on a safe manual use. Unlike industrial systems or workshops, active DIY’ers often do their cleaning at home manually or with smaller high-pressure devices. It is therefore recommended to work with a cold cleaner which has the highest cleaning effect even at low working temperatures. 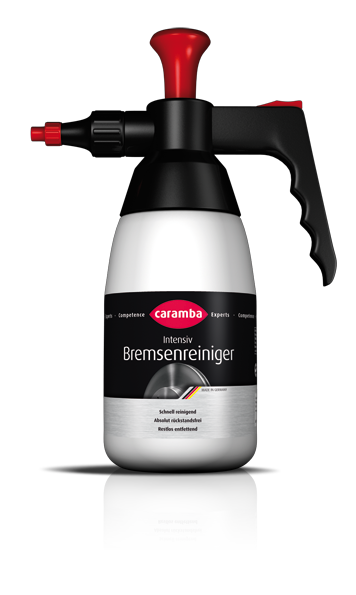 The Caramba intensive cold cleaner has been specifically developed for home application and removes fat, soot, wax, oils and stubborn crusts from engines and metal surfaces in a safe and reliable manner. Even baked and gummed up residue is not a problem for this cold cleaner. The cleaner is very safe to use and by far does not contribute to environmental pollution. Moreover, the cold cleaner is AOX-free and is therefore waste water compatible. The Caramba intensive cold cleaner is available in various package sizes and dosage forms. We recommend the 500 ml Aerosol can for occasional domestic use. Simply spray it on the concerned engine parts or metal surfaces and wash it off using a strong water jet. For large surface or regular application, we recommend the cans with 25 or 60 litre cold cleaner. In this case, an additional pump sprayer is recommended. Note: Never spray the cold cleaner on hot parts. Besides, it may only be used in conjunction with a light fluid separator (petrol separator), but may not enter into the separator together with emulsifying surfactant-containing waste water.